Smudging is the act of burning an herb, usually bundled and safe from a non-combustible container, to cleanse the room of energy before a treatment or spiritual practice. 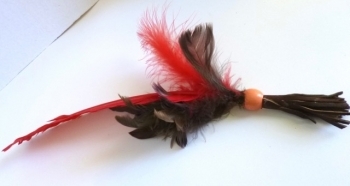 The large feathers used in these wands are hand harvested from a flock of Canadian Geese that hang around San Francisco Bay and reguarly shed. 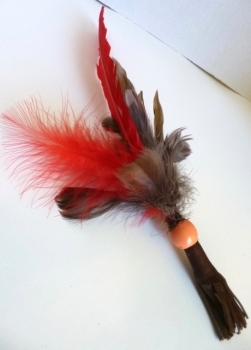 This particular wand has an apricot accent wood bead with hand-cut leather trim from sustainable scraps and feathers from Turkey and Geese. It is finished with a Reiki blessing.